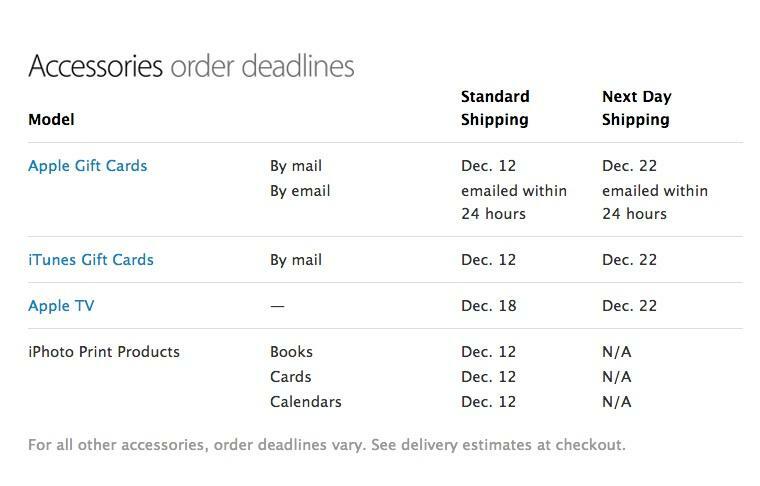 In keeping with tradition, Apple is offering free standard shipping through its online store starting today through Dec. 22. Based on last year, the company will also likely offer free next-day shipping once we get closer to the 25th. Apple is also extending its return period for the holiday season through Jan. 7 in case you pick out the wrong device, and will even pay for you to ship the device back. The company updated its website with a shopping guide, detailing when you should order each product to ensure it arrives at your door by Dec. 24. 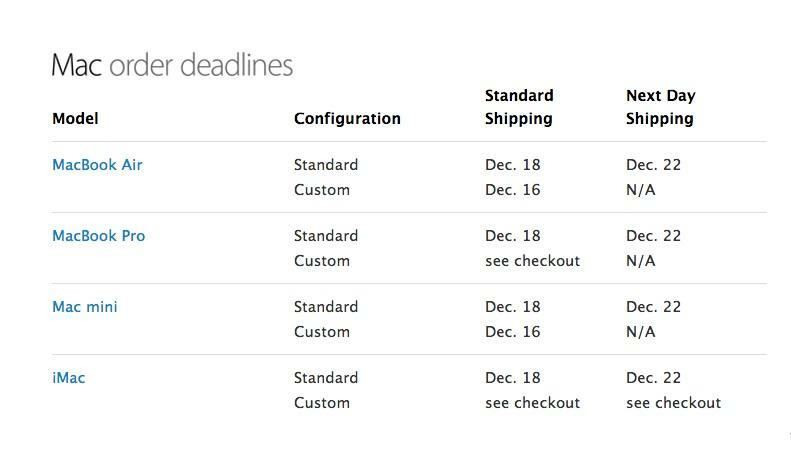 For most standard Mac computers the latest you can place your order is Dec. 18, while custom models should be ordered by Dec. 16. 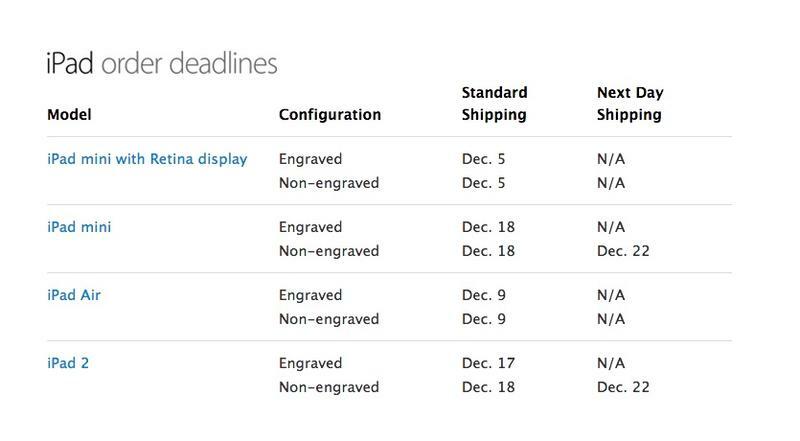 If you’re planning on buying a new iPod you’ll need to finalize your order by Dec. 18 for all models, whether or not you choose to get it engraved. 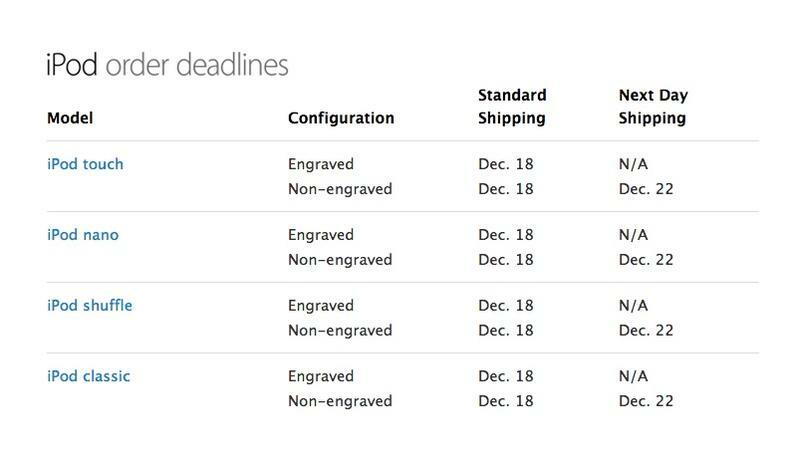 If you’re hoping to get a new iDevice you’ll need to place your order a bit earlier. All models of the iPhone 5s should be purchased online by Dec. 12—especially since next-day shipping isn’t available—while the iPhone 5c and 4s can be ordered up until Dec. 18 for standard shipping or Dec. 22 for next-day shipping. Meanwhile, the new iPad mini with Retina display needs to be ordered this week by Dec. 5, while the iPad Air should be ordered by Dec. 9—with no next-day shipping on either device. Finally, if you’re planning on turning your photos into a book, a calendar or cards using Apple’s iPhoto Print service you’ll need to place your order online by Dec. 12. The same goes for iTunes or Apple Gift Cards, though both are also available for next-day shipping, and Apple Gift Cards can also be emailed directly to you within 24 hours.